Kanyakumari to Kashmir and from Kohima to Kutch! The National Initiative to Commemorate the Martyrdom of Mahatma Gandhi is now a People’s Movement! ———————————————————————————————————————————-Mumbai: Silent March from Mani Bhavan to August KrantiMaidan. We will Commemorate, pay homage and stand in Silence for 2 minutes at 5.17pm. · Sarva Dharma Prarthana, Inter-Faith Prayer meeting. · Take a Pledge for Communal Harmony, Peace and Non-Violence. · In the morning at 11.00am, similar programmes are being held in various schools, colleges, community centres and religious places across the city & across all of India. It is during the course of the 150th Birth Anniversary celebrations, that we will also mark the 71st anniversary of the Martyrdom of Mahatma Gandhi, the father of our nation, the apostle of Harmony, Peace and Non-Violence. Gandhiji was a victim of an assassin, indoctrinated by an ideology of hatred and communal divisiveness, an ideology that is detrimental to and opposed to the very idea of a secular, democratic, modern India. Again as our nation is faced with a crisis, it’s time to recall the man and his message. Thus during the course of the last few months, various Gandhian, Socialist, Leftist and Ambedkarite organisations have come together to appeal for a nationwide call to observe the solemn day. We have also reached out to and coordinating with various Trade Unions & Political Parties across the country, so as to make this a call that will reach out to crores and crores of Indians. We have also reached out to the people of every religion, language and culture. Our objective is to ensure that the call reaches out to the masses, to every home, school, college, field, factory, office, shop and pheriwala in our country. 11.00am Call: This call for silence will be undertaken in various schools, colleges, communities and places of religious significance across the city. The BharatiyaVidyaBhavan to the Anjuman I Islam, from Jai Hind College, Sydenham, AkbarPeerbhoy to Bhavans College are all observing the same. Both the iconic Haji Ali Dargah & the Mahim Dargah & certain Temples, Churches, Gurudwaras, Buddha Viharas, Jain Temples, the ParsiPanchayat, as well have agreed to participate. 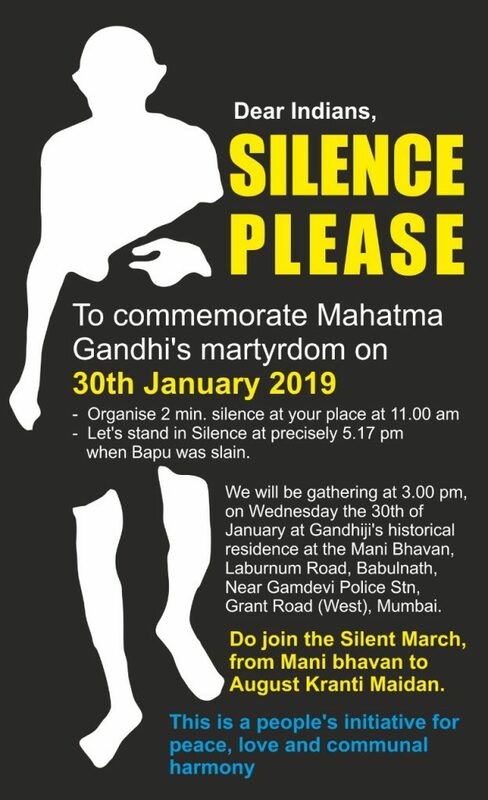 Programmes of Silence will also be held at the ChaityaBhoomi, Selfie Point at the CSMT, J.J. Flyover, Dadar Station and other prominent spots across the city. 5:17pm Call:We will be marching from Mani Bhavan to August KrantiMaidan, via Nana Chowk. We will be gathering from 3.00pm onwards at Gandhiji’s historical residence and commence our Silent March, with placards in our hand. Once we arrive at the August KrantiMaidan at 4.30pm, there will be bhajans& songs dedicated to the teachings of Gandhiji. We will take a Pledge for Peace, Harmony and Non-Violence, followed by Sarva Dharma Prarthna. Finally at 5.17pm we will observe a 2 Minute Silence as we pay homage to Mahatma Gandhi. The gathering will be addressed by Dr. G. G. Parikh, the veteran of the Freedom Struggle, who participated in the 1942 Quit India Movement and a nationally respected Gandhian-Socialist. Various political parties, which include the Congress, NCP, CPI, CPM, SP, JDS, AAP, RJD, SPI & LJD are also organising programmes across the city & will be joining the Silent March as well. The various Workers Unions, namely the HMS, WREU, NTUI have also extended their active support. Nationwide Programmes: Apart from the fact that the thousands of programmes are being held at the national level, a few of the programmes need to be mentioned. From Kashmir to Kanyakumari& from Kohima to Kutch. The programmes are being organised by Gandhi Global Family, National Alliance of People’s Movements, AkhilBharatiyaShikshaAdhikarAndolan& Yusuf Meherally Centre. Delhi:Various secular groups will be congregating at RAJ GHAT, Gandhiji’s Samadhi, as well as at the BIRLA HOUSE, where Bapu was shot dead as he was walking towards the Prayer meeting. Peace Marches and Public meetings are being held across the state.The Gandhi 150 RashtriyaSayyojanSamiti has organised programmes all across the schools and colleges of Delhi, with a public meeting at the Gandhi Peace Foundation. The BharatiyaEktaParishadhas organised a gathering at the Raj Ghat at 4.00pm. UP: Varanasi, Lucknow, Agra, Aligarh, Chitrakoot, Ballia, Unnao:A march is being held by various People’s organisations in Varanasi. Here too all the political parties have come together to organise a Silent March and include the SP, BSP, Congress and the Left Front parties. KashiVishvanathMandir too is cooperating with the call. The initiative in Varanasi is being led by the SazaaSanskrutiManch& the SarvDaliyaMorcha –Benaras, amongst others. The SarvaSevaSangh, a Gandhian organisation has given a call for a 12 hour fast to be observed by Gandhians& will be held in every state across India. Tamil Nadu, Chennai: A major programme is being jointly organised by the Tamil Nadu People’s Unity Forum, which includes various secular organisations and allied parties. Rajasthan, Jaipur, Alwar: The Pradesh Gandhiji 150thJayantiSamarohSamiti has called for programmes across the state. Madhya Pradesh: The KisanSangarshSamiti has organised programmes in Chindwada, Multai and across hundreds of its centres across the state. Here they have dedicated the struggle to the deaths of the innocent farmers and workers who are driven to penury, suffering and death, even as they commemorate the martyrdom of Gandhiji. Programmes are also being held by other secular organisations in the schools and colleges of Gwalior. LokSangarshSamiti, movement of the Tribals and Farmers has organised programmes in 10 cities/towns across Maharashtra & 7 across Gujarat. West Bengal, Kolkatta:A Secular Forum called Awaaz, an alliance of secular people’s organisations is organising the call across the state. RashtriyaSeva Dal: The RSD will be organising programmes at more than 12 states including 200 locations across the country. National Alliance of People’s Movements (NAPM) is organising programmes all across the country. Maharashtra: Programmes are being held all across the state on a vast scale. Major programmes are being held in Mumbai, Pune, Jalgaon, Dhule, Nagpur,Wardha,in every city and town across the state. The AndhshraddhaNirmulanSamiti will be commemorating the call, across its 350 centres across the state. In Vidharbha, the YuvaParivartankiAwaaz, is organising more than 100 programmes across the region. Farmer’s & Worker’s Movement: Both the Farmer’s & Worker’s movement across the country have endorsed the Call & are organising and participating in a large way. We are coordinating with the various major constituents of the AIKSCC, All India KisanSangarsh Coordination Committee which comprises 191 Farmers organisations. We are also coordinating with the major Trade Unions such as the AITUC, CITU, AICCTU, INTUC,HMS, WREU, NTUI and other Left Party led Unions. The Maharashtra RajyaSamyuktaKamgaarSanghatanaKrutiSamiti has also endorsed the call and will actively participate. Student Organisations: All of the Student organisations are actively organising programmes across the country. The AIYF is organising 500 programmes across the country. Other organisations such as the DYFI, AISA and SFI are also doing the same in a massive way. Political Initiative: Our intention in reaching out to political parties was to ensure that the coming 30th of January, the Day of Gandhiji’s martyrdom, would be a day when Crores and Crores of ordinary Indians would be aware and actively participate in commemorating and remembering the message of the Mahatma. We thus decided to reach out to both social movements and thus contacted & met secular political parties across the spectrum & included leaders from the Congress, NCP, CPI, CPM, SP, BSP, CPI-ML, JDS, RJD, LJD, that even as the process carries on. Thus as one can clearly see, that the coming Martyrs Day is indeed a spontaneous commemoration on the part of the People, from Students, Workers, Farmers, from people across all religions and regions of India. Needless to say, that our nation is facing a major challenge, where the very IDEA of INDIA is at stake, our very Constitutional Democracy under threat from regressive communal forces. Thus it’s time once again, to remember the Mahatma, the man and his teachings. Richa Singh, AvinashPatil, B.R. Patil, UlkaMahajan, Saira Shah Halim, Prof. LaltuanglianaKhiangte, Com. Charul Joshi, Com. Fouad, ShamaZaidi, Manju S. Mohan, NishikantMohpatra, MadhusudanParida, Bilal Khan, Anita Dhole, Shabbir Ansari, Putul, P.J. Josey, Bandana Pandey, NihalPandey,Krishnakant, SimantiniDhuru, SalimAlware, JayantDiwan, Jatin Desai, Ravi Bhilane, M.A. Khalid, BrijeshTripathi, Yusuf Parmar, Nuruddin Naik, Afroz Malik, NafisaColombowala, Shadab Sheikh, DhanajayShinde, ArifKapadia, Afaque Azad, SmitaSalunke&VijetaBhonkar.